I enjoy a suit that has spirit in it, and by that I mean color or print without exceeding masculinity. And sure were Mr. Giornetti’s suits nice to watch, but they came in silhouettes that would only look flattering on half of men: jackets either cropped at the waist that made them appear you were short on cash, or belted. You either had to be of certain height or weight to pull of these looks; as someone short and average like me, I’d have to pass. His single-breasted pinstriped and navy suits were the only ones that spoke common sense. But the star of this collection was his outerwear: beautiful Aztec print sweaters and cardigans; coats with contrasting stripes shown throughout in various forms; boxy-cut pastel coats with leather or fur collars; and ultra-luxe leather jackets, such as a smoked brown or buttery blue piece. And even though much of these clothes could have done better with simpler styles, one thing for sure is these were items made to enjoy, look, and display. That’s luxury. 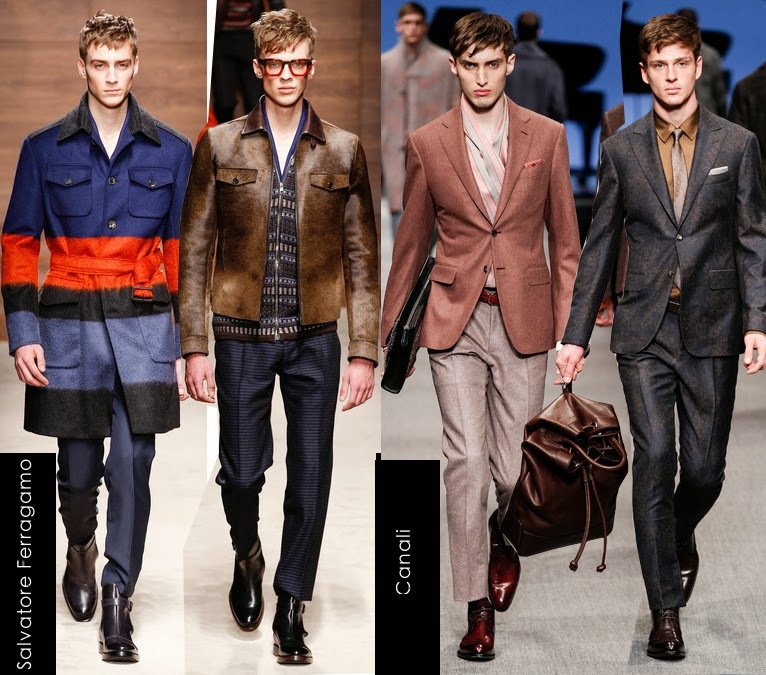 On the other hand, Canali understood how to mix young and business into their fall collection. Canali is no doubt one of Italy’s finest suit makers. And it screams luxury, just like it did at today’s presentation. 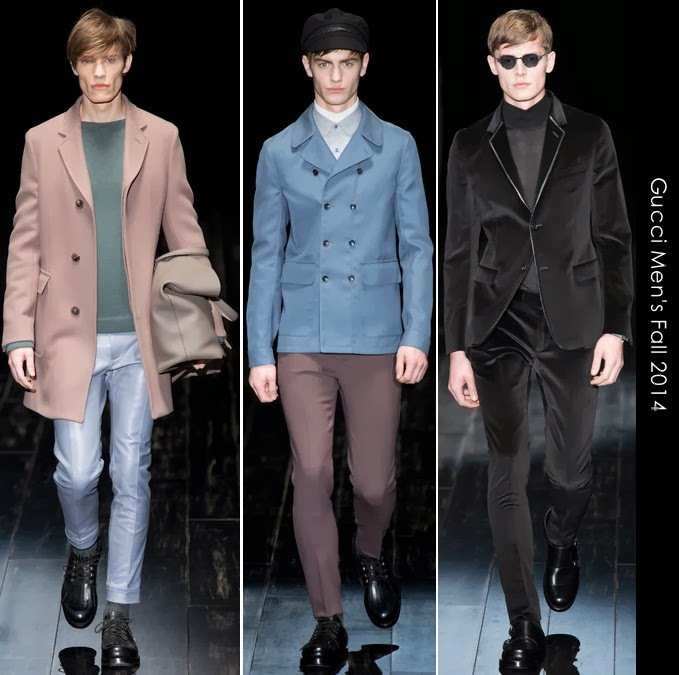 Lately, the label has found ways in turning strictly office wear suits into fun and decadent colors for that customer who praises fun: long silky scarves wrapped around the neck; quilted coats and fur for the refined gentleman; slim-fitted pastel trousers and suits (in blue, rose, and green), and other chromatic colors done in plush velvet, wool, and exquisite prints. Looks were finished with low-top boots for an edgier touch. Who said business is not made for young trendy guys? 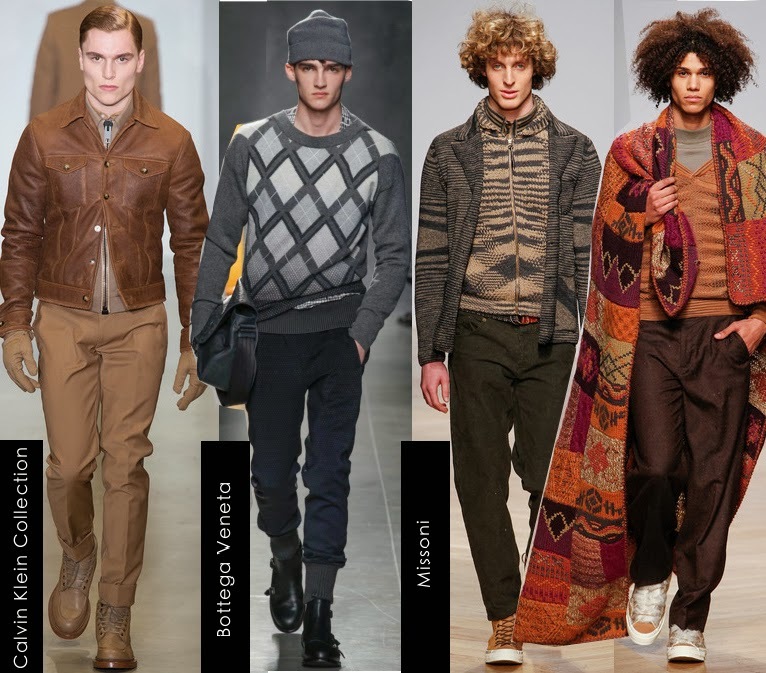 Bottega Veneta, Calvin Klein Collection, and Missoni were the ones that projected more of a sportswear movement in their men’s wear line. Italo Zuchelli has had a fascination for futuristic themes. “Tough” was his next move at Calvin Klein. But for me, it was more of a tedious presentation of fine fabrics that could have been narrowed down to 18 looks. Too repetitive. And too costume-y. His loosely-pleated or tapered trousers and manly denim jackets deserved some props. Missoni may have also done the same overt designs, but the truth is Angela Missoni knows how to keep it up to date. Her new collection was super relaxed and safely played with her signature prints – chunky zigzag coats, sweaters, and cardigans. I was satisfied, but even more with her hand-made blankets in wool that transmitted coziness and happiness; she knows her customers very well. It was Tomais Maier of Bottega Veneta though who put chic into his laid-back weekend men with intricate tailored and fitted jogging pants worn in the most effortless and luxurious manners. This was a triumphant and quiet (unexpected) move coming from Mr. Maier. Meanwhile, Frida Giannini at Gucci was the one that hit a high note of casualty with superb paper thin leathers, wool fabrics, and a sprinkle of fur. Simplicity all around à la Gucci. Tailoring was kept intact – with slim-fitted blazers and sumptuous skinny bottoms. These were often paired with either wool or subtle leather pants (best use of tailoring I have seen for such a material), and knits or leather button-down shirts that felt very comfortable in dusty pastels – powder blue, cream, sage, pale brown, and teal. Boxy outerwear - especially in pea coats and biker jackets – could have appealed better if they had cinched a bit more inches to the body in my opinion. And eveningwear was astonishingly absent in prints and instead insisted on black wool and velvet suits with insets of leather lapels. In general, Ms. Giannini kept it polished with those practical fisherman caps etched with leather strips that said nothing boring about the Gucci man. He may be drastically quieter compared to last season’s floral prints, but he still has lots of game next fall. And for the designer, more reputation among her young clientele.